The funny thing about the transportation when you are living and travelling in Vietnam is it comes in forms that you never expect. 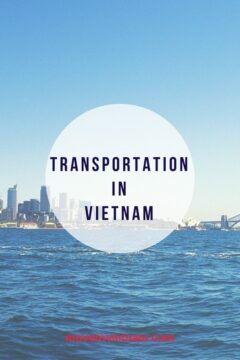 I remember sending a postcard to my friends in Denmark, I told them that I've experienced to ride a bus, motorbike, boats, bowl boats (the ones you get to try in Hoi An, and many more unusual form of transportation. I personally find riding a motorbike in Vietnam fascinating, I think we can all agree with that. The buses can be too slow when using around the city, but travelling around the country, this is the most efficient and cheapest way. The inter-city buses are very cheap although expect to leave a few minutes if not hours earlier before you can reach your destination. If you doesn't speak the local language, it can also be tricky. You can use this app on your phone to track the time schedule and the fare prices. Overnight buses are reasonably priced, often they are also timely reliable. These buses also have reclined seats which makes it more comfortable especially for longer journey. These reclined seats can be a little too narrow or short for some Europeans and Westerns. These overnight buses can both be used for travels within the country and to the neigbouring countries as well. For overnight buses, during the peak season, make sure to book your seat in advance to avoid any hassle. They can be booked online here. I might sound overreacting if I say you definitely should give driving a motorbike in Vietnam a try, but in all seriousness, this is something you won't want to miss. Either you are a traveller just passing by or an expat who are looking or already living here, you know that motorbike driving in Vietnam is crazy. Motorbike is the main transportation here, although the government doesn't want it to be as it's dangerous and add so much air pollution. At the same time, with the lackness of efficient public transportation in the country, the national government can't do anything about this. 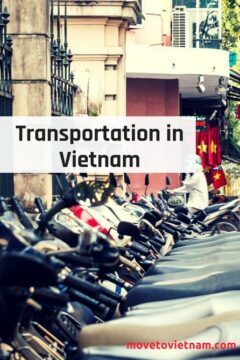 Even though the main roads are congested with the number of motorbikes in Vietnam, and even though you already know how to drive your own, the traffic rules here can definitely blow your mind. Check out this video to have more idea what I'm talking about. 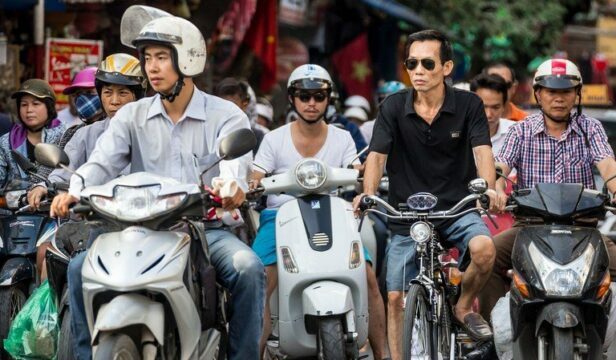 Vietnamese, expats, and travellers both rely on motorbikes to get around. 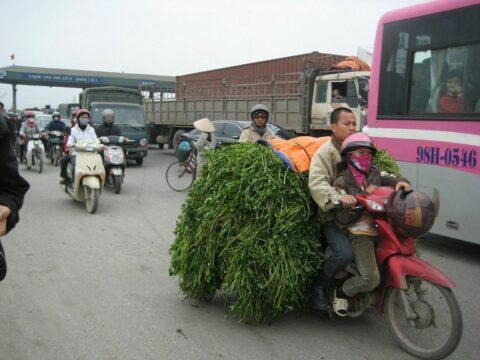 You will notice people carrying unbelievable things on their motorbikes. Locals also carry up to four people, although this is definitely illegal. Here is a guide for motorbiking in Vietnam, everything you need to know or check out these affordable motorbike tours in Vietnam. If you will be living in the outskirt of the city, smaller towns, and provinces, hopping on your bicycle can be very efficient than driving a motorbike or taking the bus. It's also a lot cheaper, better for the environment, and healthier. However, there are no bike lanes in Vietnam, personally, I've used a bicycle around Hanoi. Although it was fun, it was also very dangerous because I drive in the same lanes where big buses, cars, and fast motorbikes are driving. Starting the second week of April 2018, UBER app is no longer operating in Vietnam. A Singaporean based same functioning app is now overtaking Southeast Asia. Grab lets you book a car through your phone, they also let you do a carpooling, request a bigger car, even booking a motorbike taxi (motorbike taxi is not available in all Southeast Asian countries). You can pay with your card or cash. Using the app, you can add your pick up and drop off, you can also track the driver's current location or your own whilst you are a passenger. The price is reasonable but not the cheapest, however, it is very convenient and timely reliable. I've used the train in Vietnam only a few times, the only thing I can comment on the experience was that it's worth it. 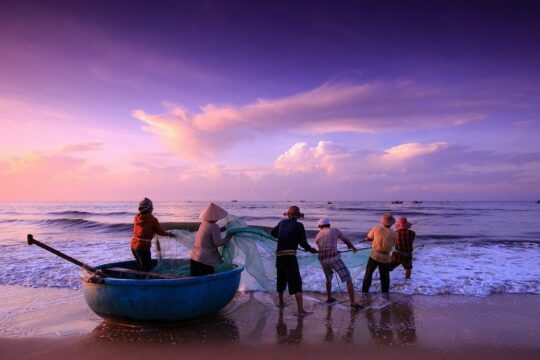 If you are travelling and doesn't have much time, it is a great way to see the beauty of Vietnam. Taking the train is not the cheapest option neither the fastest although it's the most comfortable. There are sleeper trains in Vietnam that lets you have a better sleep at night and a chance to walk around. Flying in and out of Vietnam is easy peasy. There are cheap flights both for domestic and international. The top destinations for domestic flights are Ha Noi, Ho Chi Minh City, Da Nang, and Nha Trang . Whilst the most frequent destinations internationally are Bangkok, Singapore, Malaysia, Australia, Indonesia, the United Kingdom, and the Philippines. If you are travelling within Vietnam, it is worth it to check the flight prices instead of taking the bus or train. Affordable flights are common, flying is always more convenient than the other options, although taking the bus or train is also an experience that must be tried. Local airlines are VietJet and Vietnam Airlines. International airlines that operated in Vietnam are AirAsia, JetStar, Cebu Pacific, Scoot, Cathay Pacific, Thai Airways, Singapore Airlines, China Southern, Korean Air, American Airlines, Japan Airlines, Eva Air to name the few. It's not everywhere in Vietnam that you can use a boat to get from point A to point B. In a few places like Ha Long Bay, Phu Quoc, and other small islands, boats are must use to get to your destination. The prices can vary depending on your destination, in Ha Long Bay they mostly like cruises whilst in Phu Quoc they simply is a transportation.